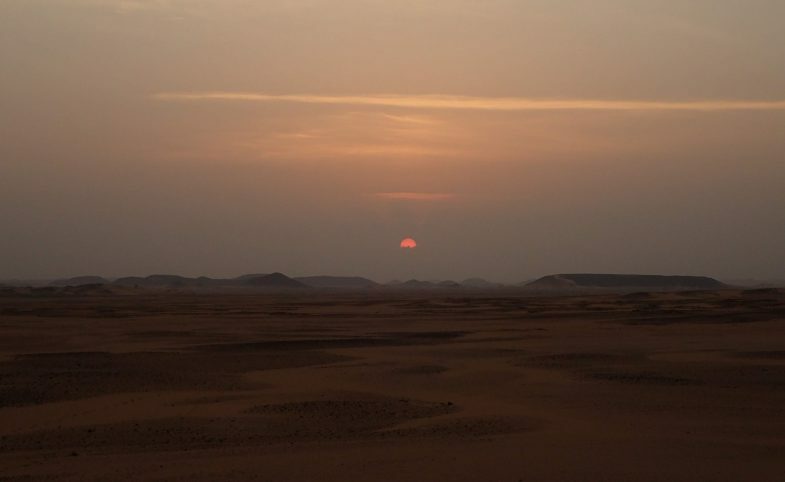 With the ugly face of climate change appearing with increasing frequency even within the comfort of the West, those surviving on Earth’s wildest fringes face conditions severe enough to threaten not just their livelihoods but their entire existence. 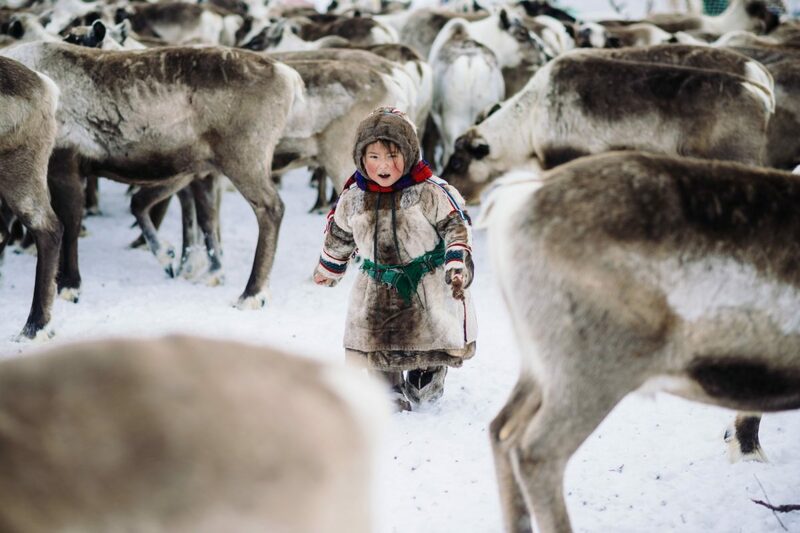 In Siberia’s far north west, live the nomadic Nenets of the Yamalo-Nenets Autonomous District. Here, life exists only by the mercy of the environment. 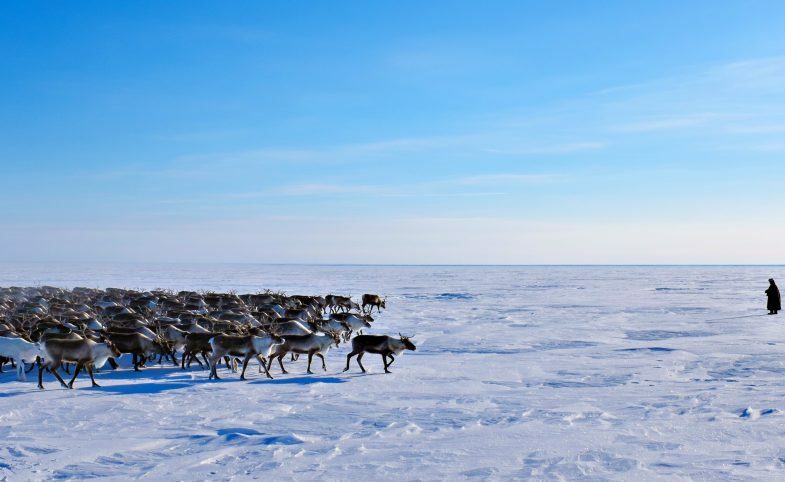 Remote and wind-blasted with a permafrost coating, separated by the Golf of Ob to the east and the Baydaratskaya Bay to the west, the Yamal Peninsula is home to about 10,000 Nenets, herding an estimated 300,000 domestic reindeer. 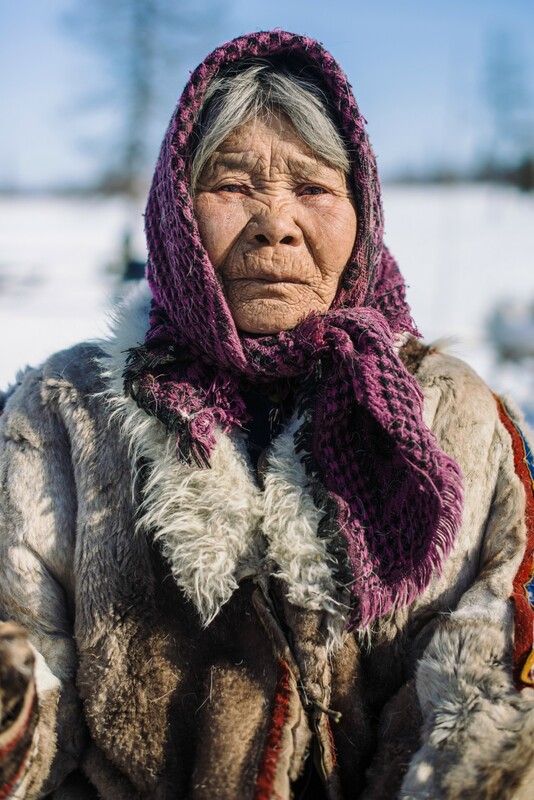 Living as they’ve done for over a thousand years, well within the Arctic Circle, with pressures both political and environmental, their grasp on this traditional way of life is slipping. 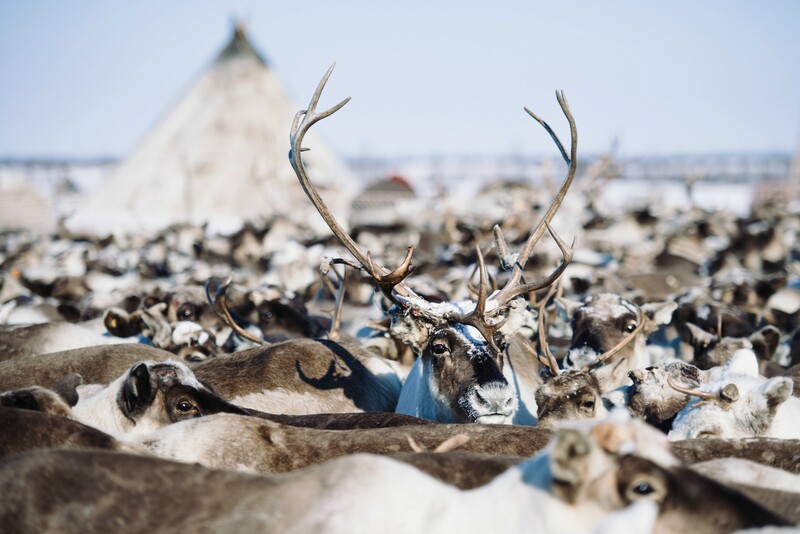 In March of 2018, the Nenets were faced by particularly extreme weather conditions when unseasonably heavy snowfall aligned with the biggest and most important migration of the year as they faced the Gulf of Ob. 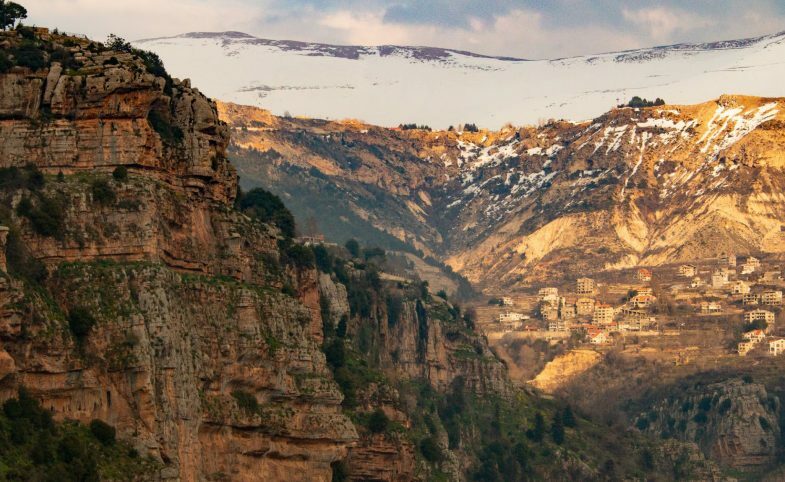 Following the snow, the temperatures plummeted into the range of -40ºC, freezing the already impenetrable layer of snow. 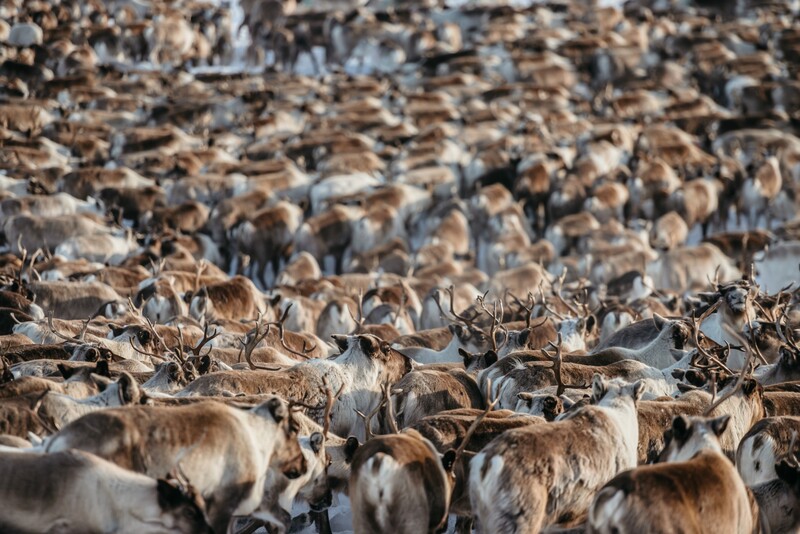 Any available food for the herds firmly out of reach, stationary groups opted to sit out the worst of it, preserving the strength of their herds, while herders already on the move could only sit by and watch as their reindeers starved to death. 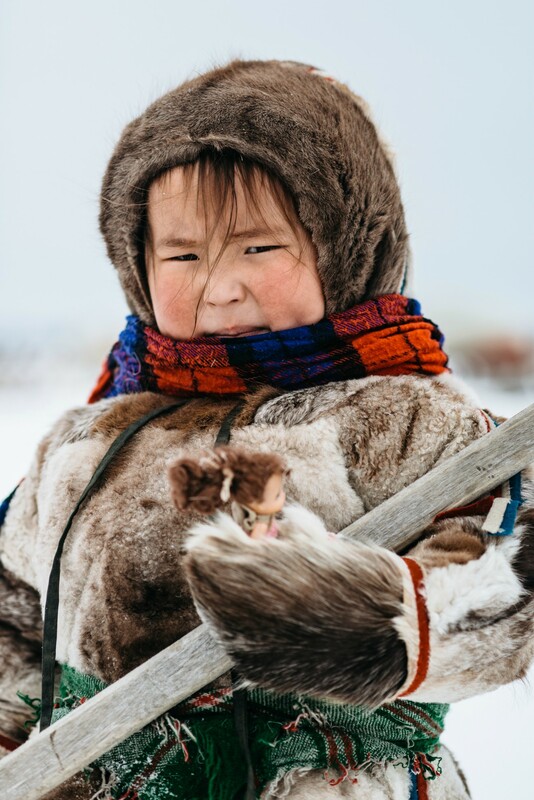 It was during this time that professional photographer Lee Kearns joined the Secret Compass expedition to immerse himself in the Nenets culture. Now upon his return to the UK, Lee was kind enough to share some thoughts and images from his experience. 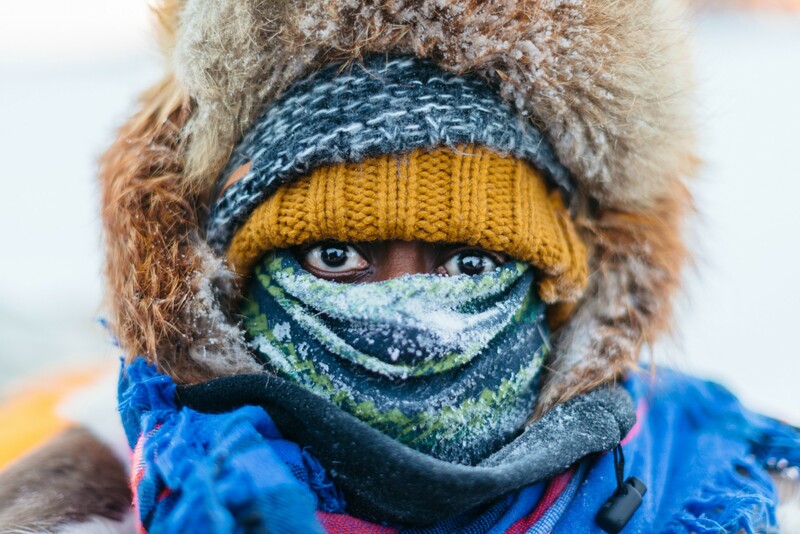 So the weather was pretty extreme on this year’s Nenets expedition, how did you cope with the extreme cold? 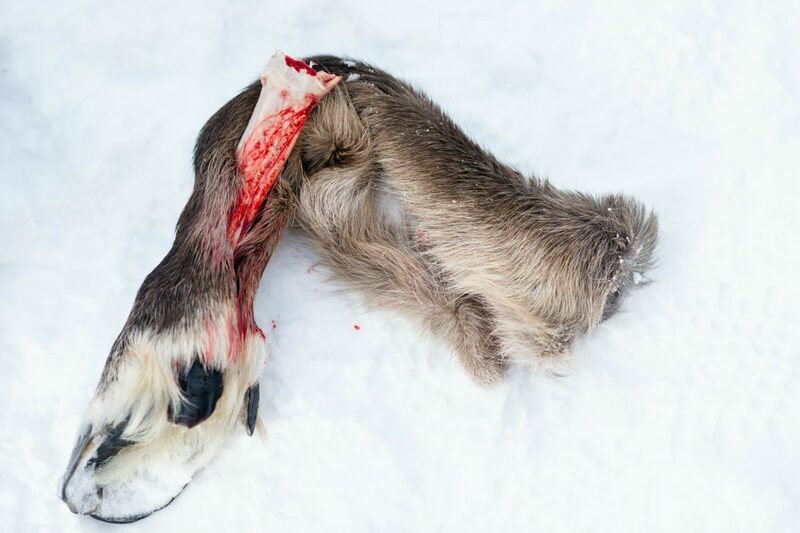 Sadly due to the weather we were unable to migrate with the Nenets while we were with them. 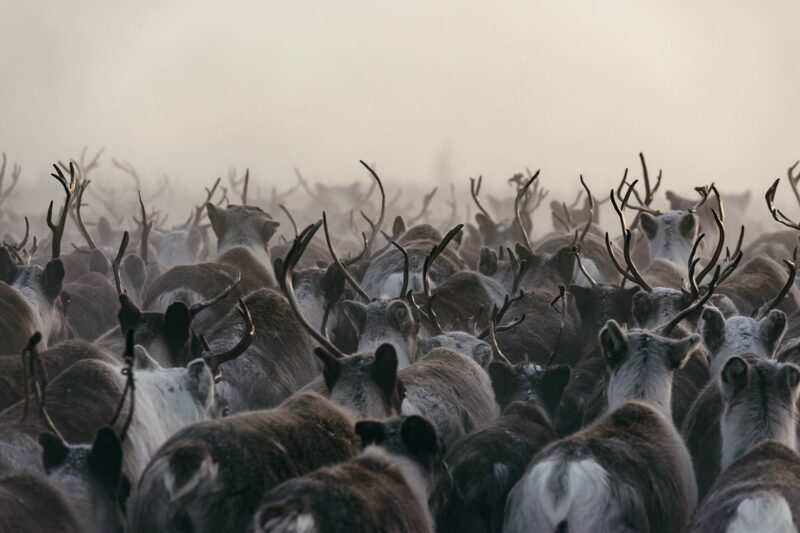 The snow on the other side of the river was too deep for the reindeers to feed and the families that had already made the crossing were struggling. As a result, we spent far more time with the families and got to see a bit more of their day-to-day lives. Away from camp we used a Malitsas (reindeer fur coat) and reindeer skin boots, which were amazingly warm. The boots covered most of my legs which we wore bare-foot. The most challenging thing about wearing the boots was not slipping over as they had no tread. 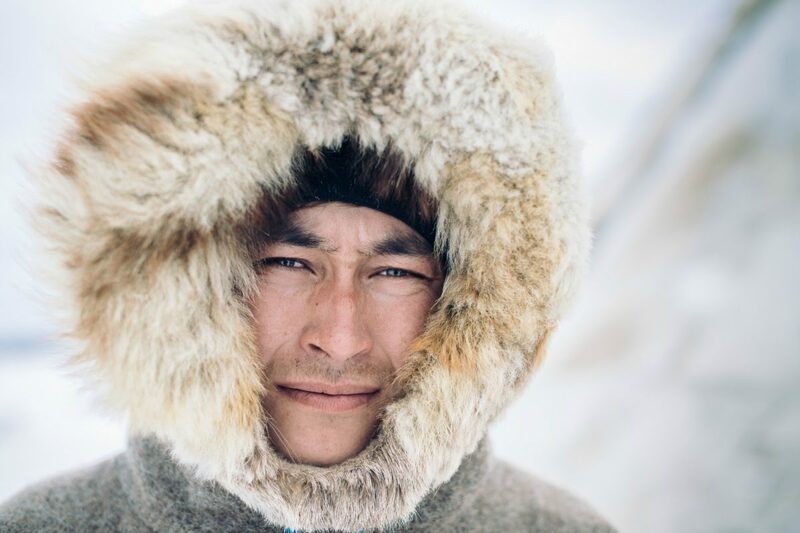 Around camp I’d wrap up warm with multiple layers – usually a down Jacket and merino base layers. This was easier to help out around camp in as the Malitsas were a bit restrictive. How did a typical day look? A typical day saw us helping out with various jobs around camp, broken up with numerous tea breaks. The most common tasks needing to be completed was fetching water and getting wood for the fire. For water, we needed to dig down though the snow until we reached ice. We’d then chip away at the ice with a spear like stick. The ice was then scooped up into a sack and taken back to camp on the back of a sleigh. Wood was collected by cutting a tree down then carried back to camp on snowmobiles and then chopped up back at camp. With the weather stopping the migrations this year then, you’ll have spent far more time with the families, can you tell us a little about the families you got to know over the time? The chum I stayed in had Victor, his wife and their two children, Dennis and Arina on one side of the chum. On the other side on the chum was Lowa, Yulia, Mikeal and Pasha. This was a slightly different set up to the other two chums which had family groups on both sides. Yulia was staying to help out on in the chum as the brigade leader and his wife were away. 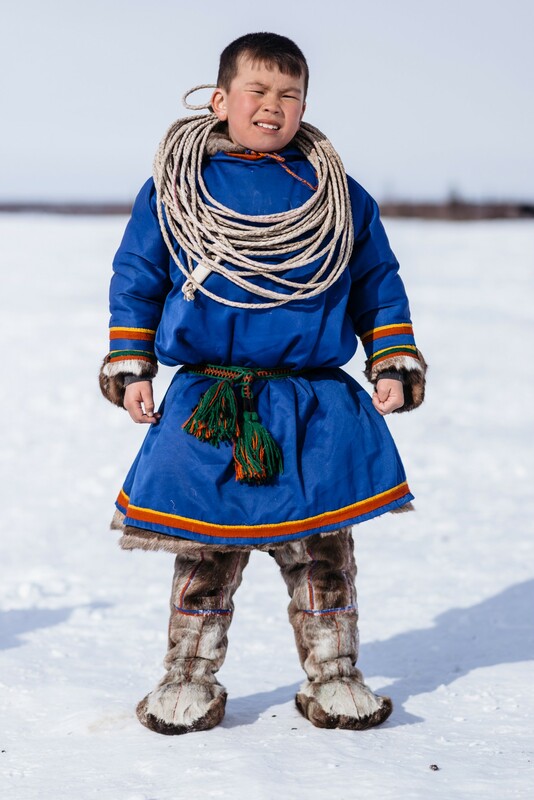 Lowa, Dennis and Arina would spend most of the days playing games, building small ‘chums’ and practising with the lasso. We only got to spend a few days with Dennis and Lowa as they headed back to school along with children from the other chums. 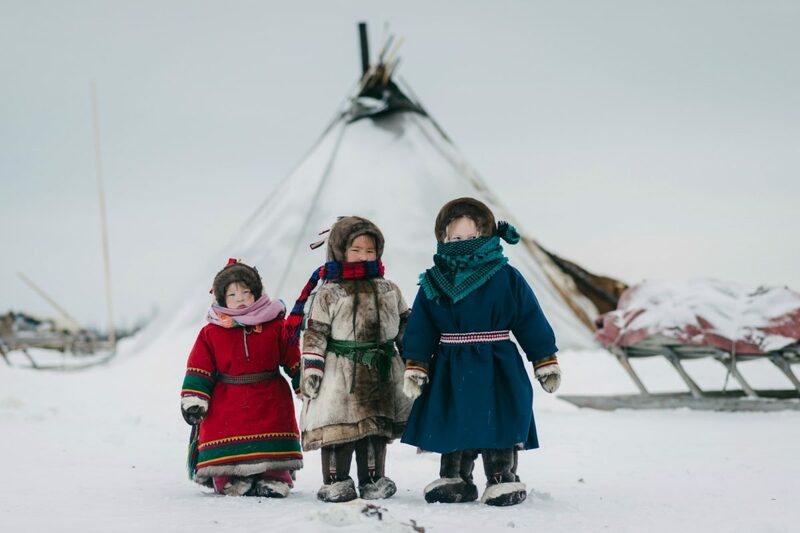 Most children over six attend boarding school and only see their families during the holidays when they return back to the tundra. 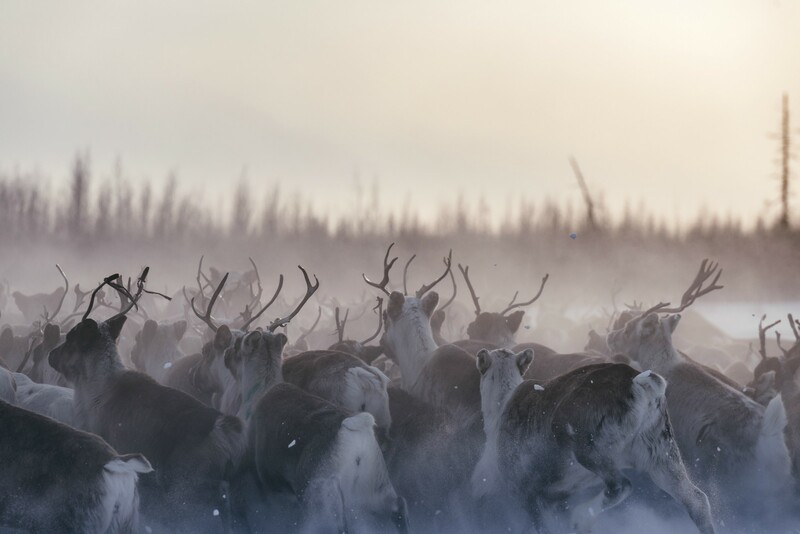 Mikeal and Pasha would spend their days herding the reindeer with the men from the other chums. One day I got to head out with Mikeal and Pasha to visit other camps. One family we visited were preparing to move their chum. Everything had been broken down and loaded up on to sleighs. Mikeal and Pasha had arrived to help sort and prepare the reindeer for the move. 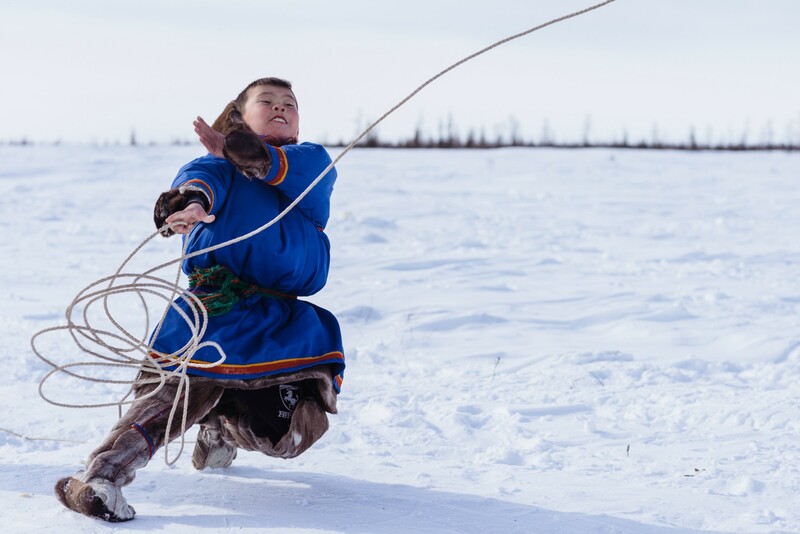 After this, we stopped at another camp for tea and snacks of frozen meat before the guys started practising their lasso skills. Mikeal even had a little wrestle with one of the guys from the camp, practising for the wrestling competition taking place in Yar Sale during the festival. Pasha was also getting ready to take part in a reindeer race during the festival having come first in previous years and winning a snowmobile. What are your lasting thoughts of their lifestyle? 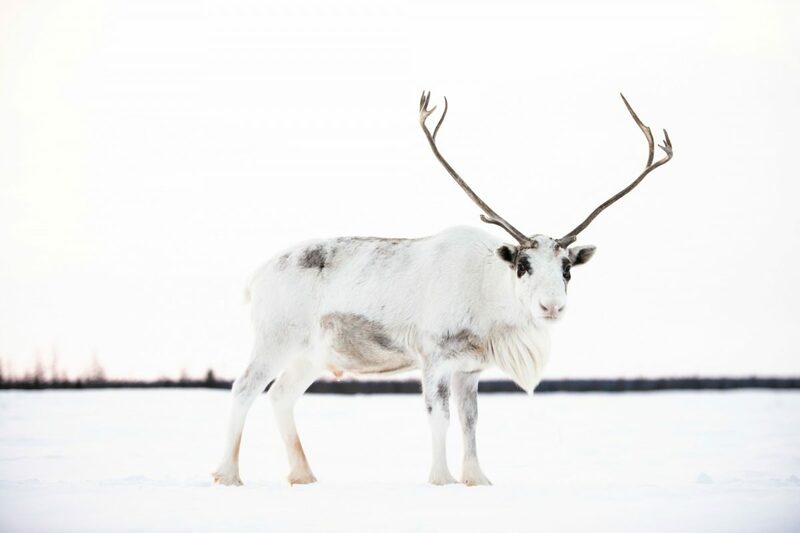 People are always busy, repairing sleighs, preparing wood for new flooring, checking on the reindeer, fetching ice for water. 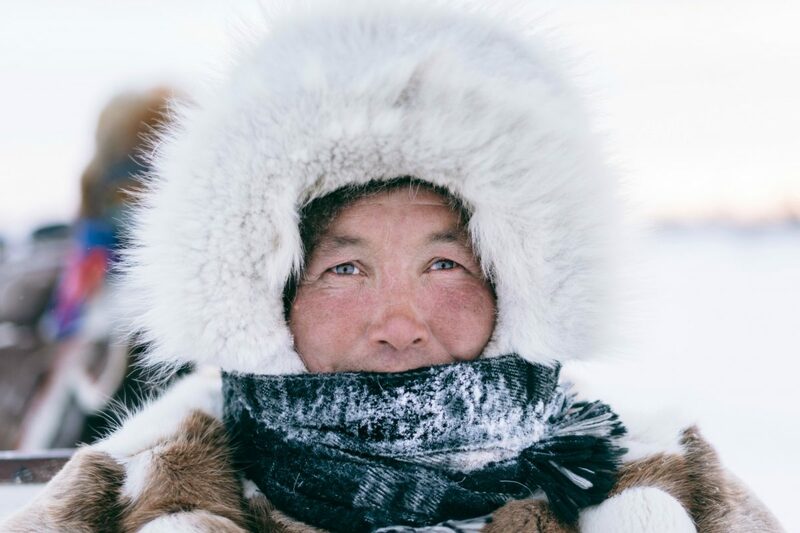 While there were always things to be done and living in the extreme conditions is hard, the pace of life was a lot slower and felt calmer than life in the city. While their lifestyle hasn’t changed much over the decades, technology is creeping in. Everyone has a mobile phone and the chums all used snowmobiles making access and communication with the towns a lot easier. With climate change also affecting the weather, I wonder how much longer the way of life here will survive. 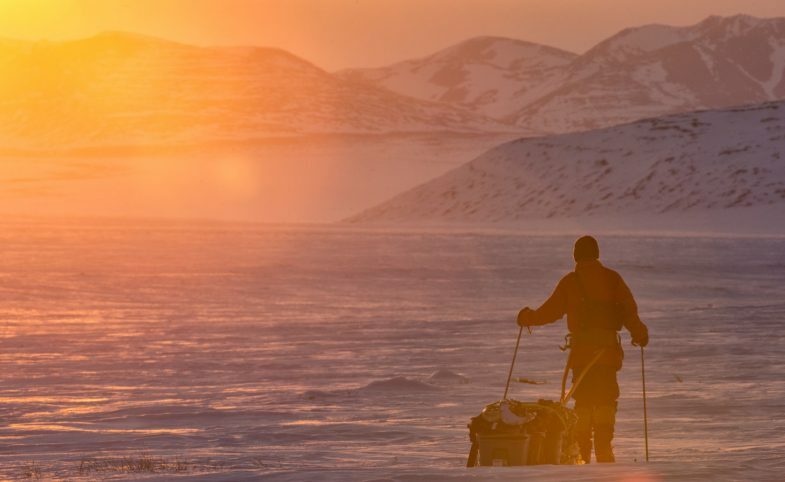 Is the arctic tundra somewhere you see yourself spending more time in the future? I’d like to head back at some point in the future although I think my next trip will be somewhere warmer. I’d still like to see the migrations taking place but I’d also like to visit in the summer to see how the landscape changes. 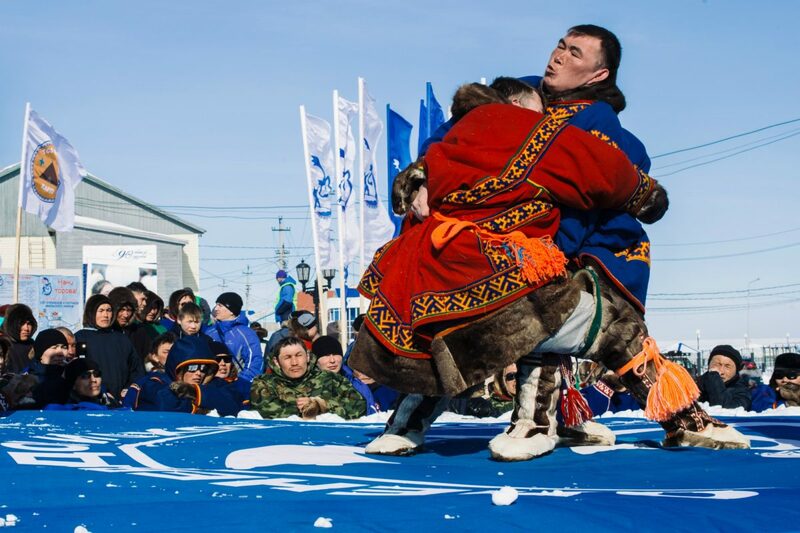 Of course the extreme weather presented a unique set of challenges to the families and the teams this year, but what other challenges do the Nenets face daily and did you experience any of them? Collecting water to drink was one of the challenges we faced daily. 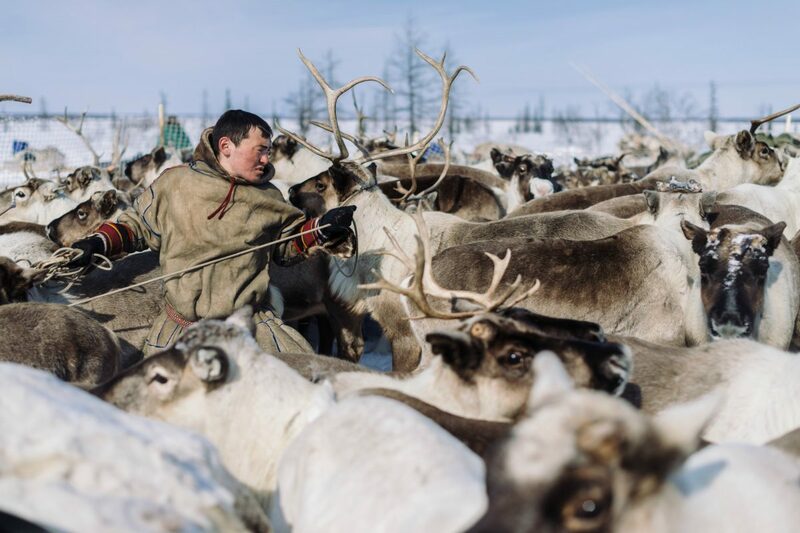 Making sure the reindeer have enough food is one of the biggest challenges the Nenets face. If they stay in an area too long they can overgraze the area damaging it for future use. On the other hand if they move on to soon they can end up in an area where the herd haven’t got enough food. 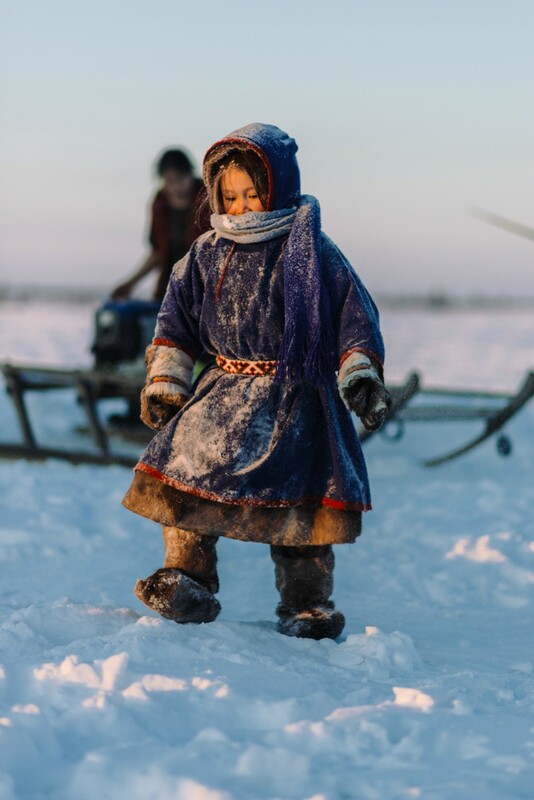 Working in darkness is also another of the challenging conditions the Nenets have to face. 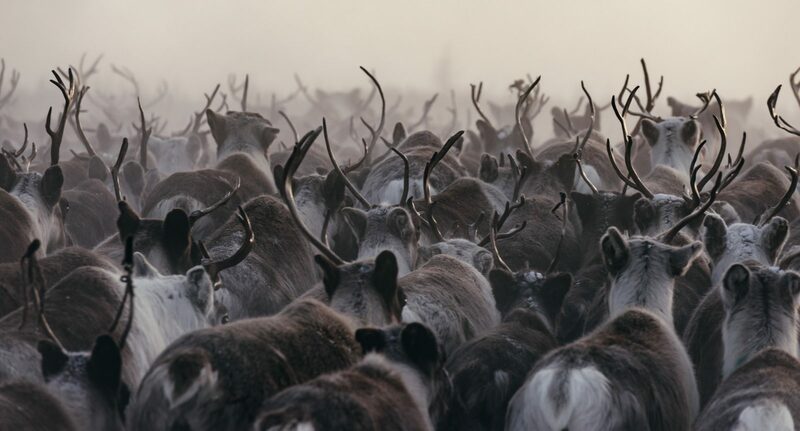 The herders would often head out late in the day to gather the reindeer and would often be gone till after the sun had set. We found this odd and wondered why they didn’t head out sooner so they could finish the job before the sun sets. On reflection they would be used to working in the dark conditions as during midwinter they can have as little as 3 hours of sun. How did you find your return to Moscow after so much time out on the snow and ice? It was actually more of a culture shock returning to Moscow. It was almost the complete opposite of tundra life. 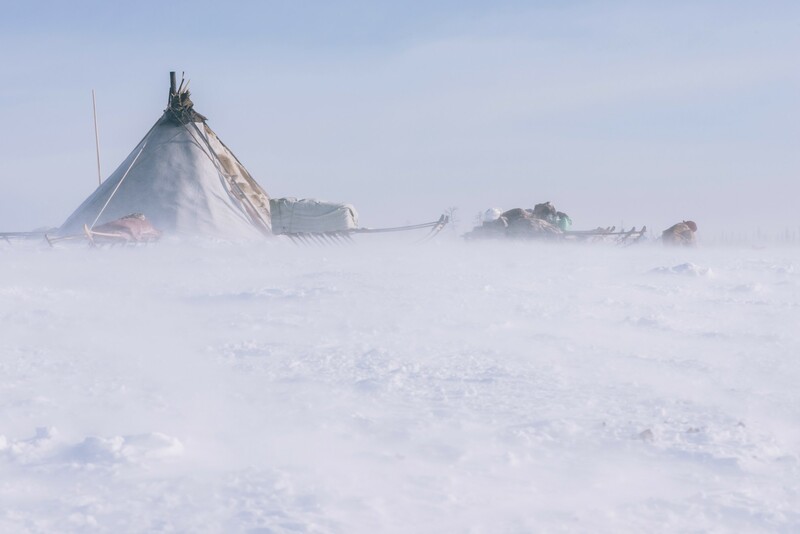 While on the tundra there are so few people around but you’re living very closely with everyone on camp. There’s not much private space, you sleep next to each other in the chums. 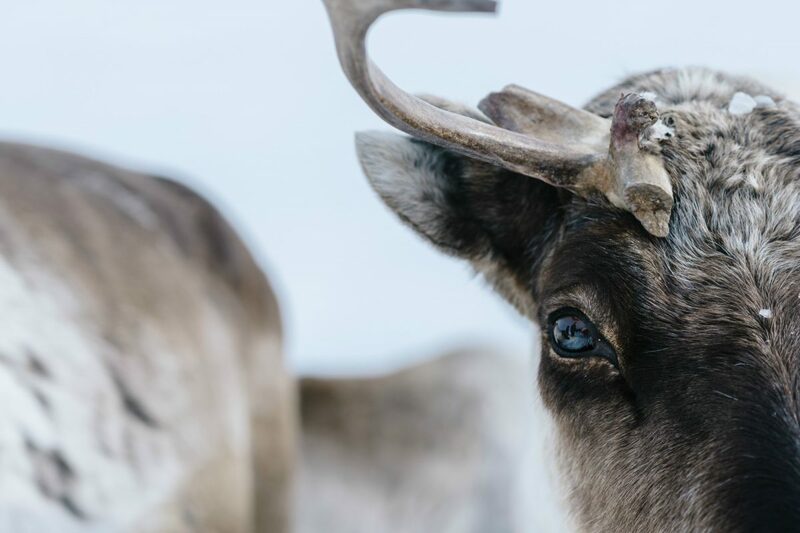 The only time you’re really alone is when you go off for a bathroom break and that’s only if you’re lucky enough not to have a reindeer follow you. I spent a few days in Moscow after the rest of the group had gone home and it felt strange to be on my own yet surrounded by people. The temperature in Moscow was also around 20ºC while I was there which was great after a few weeks of -40ºC. 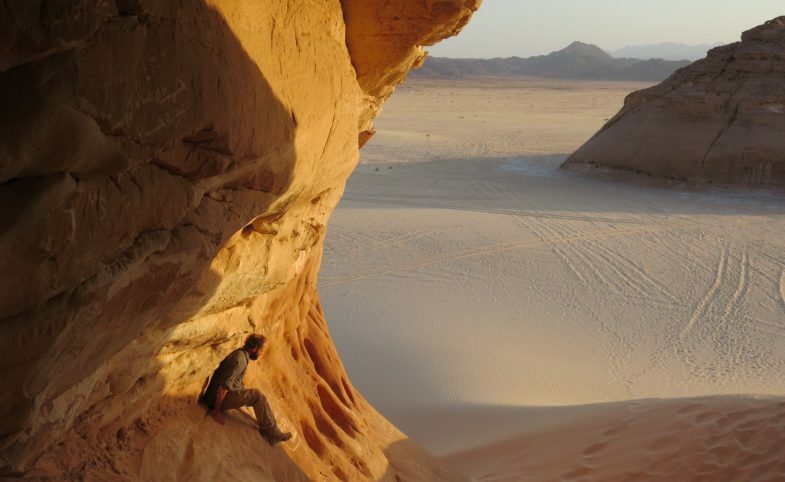 Check out more of Lee’s photos through his Instagram page here.